As I’ve mentioned before, I’m a huge proponent of shopping and dining locally. Alabama has an unbelievable wealth of local merchants, artisans, and restaurants, and the more we support these businesses, the more of our money stays in Alabama and makes it an even better place to live. I do better dining locally than I do shopping locally, because let’s face it: I have two kids in tow. Amazon is, on most days, a lot more pragmatic. However, I’ve found a site that can help me shop locally while being able to shop from my computer – how awesome is that?? Shop Birmingham offers online shopping from many local stores – browsing their online marketplace is so exciting, especially for gift giving! And, speaking of convenient online shopping, you can buy gift certificates for many local stores online – a great way to support the local economy when you’re running late on buying a present! But Shop Birmingham is so much more than just that. They are a resource featuring menus, gift certificates, products, services, and general contact information for many local businesses in the Birmingham metro area. Also, it’s a great opportunity for local merchants. At no charge whatsoever, they can list their business information and up to five items for sale in the online shop. It’s a great way to get recognized as a local business, and to be able to easily offer online ordering! They also offer more in depth services for a fee, so they can get as much value as they desire out of the site. But if you’re not in Birmingham, don’t despair! Shop Birmingham is expanding rapidly. They currently have two more sister sites, Shop Mountain Brook and Shop Homewood, and are planning on expanding throughout the state! Keep your eyes out for a a site near you in the future. Now for the giveaway part: Shop Birmingham gave me five awesome T-Shirts to give away to you! Now – back to the shirts. They are a great way to remind people of the value of shopping locally – and they’re awesome looking shirts, too. They sell on Shop Birmingham for $20 each, and they wear very nicely – I’ve been enjoying one myself the last few weeks. AND if you’re not from Birmingham, feel free to still enter!! 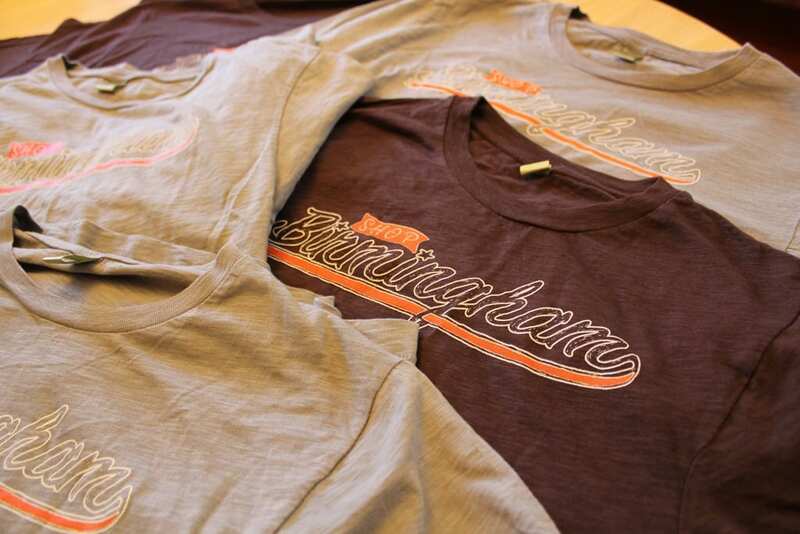 You can have a souvenir from your favorite blogger’s (ahem) hometown. If you would like to win one, just comment on this post and tell me which shirt you’d like to have. But hurry!! This giveaway is only open until Monday, October 31st. 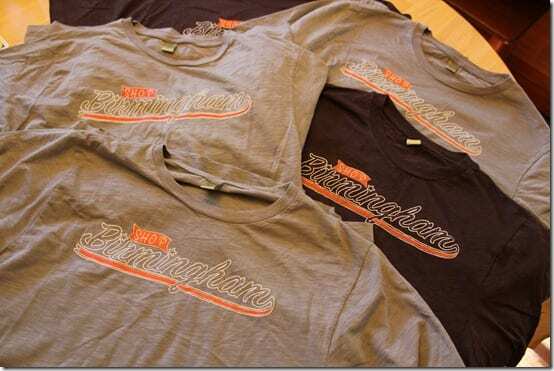 Checking out ShopBirmingham.com and tell me one thing you like from the Local Marketplace. Again, this giveaway is only open until Monday, October 31st. The winner will be randomly selected and posted on my giveaway winners page on Tuesday, November 1st. Disclaimer: I was not compensated to write this post. Shopping locally is an awesome thing to do no matter where you live. Try it, you’ll like it. Next Post The Elevator Incident. Previous Post The Gyrobowl: Smarter Than A Baby? I love your blog and the idea of shopping locally! I’d like a grey large–pick me! pick me! Is Shop Vestavia on the way too? I believe it is one of the ones in the future plans, but for now, any Vestavia Businesses would be listed on the Birmingham site – at least I’m pretty sure that’s how it’s working right now. I’d like the brown large. I would like a Medium. At least I am from Birmingham. I like the Cageless Dog Boarding from Dog Days in the Local Marketplace on Shop Birmingham. I would choose the large brown. I’d like the brown medium, though I’d really take any of them, since my husband would wear a size large (and he loves free shirts, especially when they have no significance to him whatsoever, like shirts from races that his sister has participated in). Would love a large gray shirt. Aw, thanks!!! Yes, they get to be MUCH more fun in the later months – at least in my opinion!! I start having “fun” with babies around 5 or 6 months old. But at two months, they’re so adorably tiny and cuddly!! I hope yours is doing well!! I’d love a medium shirt, whatever color is fine! I really, really want the Lego Harry Potter Knight Bus for Christmas. Just for me. My husband wants one of those, too!! He’s definitely been eyeing it. He chose Hagrid’s Hut for his birthday instead, but the Bus was a close second! This California gal would love to wear a souvenir of your hometown…medium brown please! I’d love one of the Large Grey Tees! I really like the Dickens Train Village Snowglobe at Lamb’s Ears, LTD.! I want the houndstooth coat! SO cute! Great!! Do you need recommendations of where to eat / stay / etc? I hope you have a great time here! !